The aim of this project is to detect junctions in biomedical images. 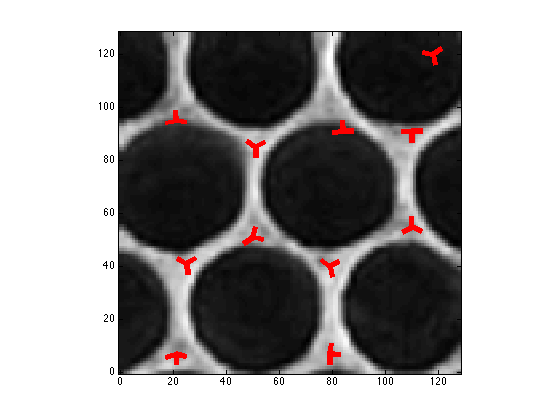 Since junctions are very common in nature, knowing their position and shape allows us to do cell segmentation in image processing and can also give biological and physical properties. The algorithm uses steerable wavelets to detect 3-fold non-symmetric junctions. It is based on a semi-matching template : a grid of each possible angle between the 3 branches is created. For each angle, the algorithm calculates the optimal steered angle by solving an equation, and then returns the value of the projection of the wavelet over the image. For both binary and real images, the junctions are detected but in a less accurate way for the real images. This is due to the non-uniformity of the image. 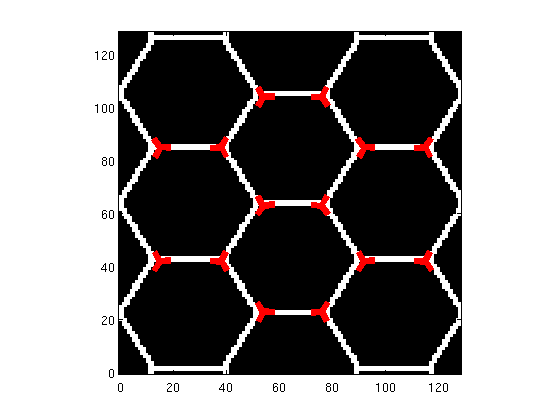 Figures 1 and 2 represent the reconstruction of detected junctions for an hexagonal lattice (binary image) and a honeycomb (real image).